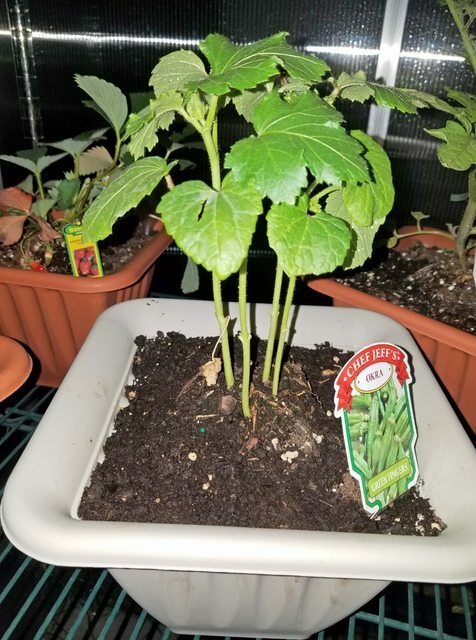 I bought some young vegetables (maybe 5 inches tall), and some of them were grown in tight bunches of four; mainly the okra and beans. They came in small containers with a diameter of about 3 inches. While transplanting them to larger containers, I thought they should probably be separated... but they were so close together, I was sure I would destroy all the roots. Thus I left them in bunches for now. Should they be separated? How important is that? If so, why would they be grown so darn close together, and how can I separate them without destroying the entire root system? Yes, they should be separated, otherwise they will compete and stop growing. You can either wet the soil to separate them easily before transplanting (too late now), or you can cut the unwanted ones just a little bit above the soil. After a few days the roots will loosen enough to be pulled out with less damage to the live ones. As to why they are grown close together, it's because on a small cell were sown multiple seeds for the eventuality that not all of them will sprout. The seller doesn't separate them because customers usually thin them out by themselves, or they will plant them separately anyway when they reach home. Not the answer you're looking for? Browse other questions tagged vegetables containers transplanting roots or ask your own question. How do I grow root vegetables in pots/grow-bags? What vegetables can be grown effectively in a small, urban garden? What herbs/vegetables/greens can be grown in a balcony garden with limited sunlight? How should I be fertilizing my container tomatoes? Can pak choi be re-grown? Can I transplant young Rose of Sharon plants in July in Zone 6a? How can I cross breed two root vegetables? How much depth is needed for vegetables to grow in an indoor area? Why shouldn't I water a Blue Spruce tree during and after transplanting it? How/if to transplant a 15' Catalpa?